Ever looked at all those options for your title when you’re filling in a form – Doctor, Professor, Lord, and Sir – and wondered how anyone could acquire a noble title like that? We’re sure you’d like to know how to become a Lord or Lady. It’s actually a lot simpler than you might think to buy a Lord title, thanks to the Royal Family of Sealand. You don’t need a mansion, a relative in the House of Lords, or a lot of money. 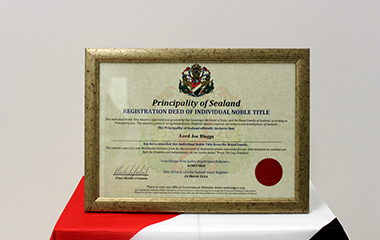 By purchasing a Deed of Individual Noble Title Ownership, Prince Michael of Sealand’s Royal Family will grant you the title of Lord or Lady of Sealand. While there’s no option to build yourself a magnificent country mansion or take ownership of acres of land with these Lordship Titles, the certificate you’ll receive will give you the right to style yourself as a titled Lord or Lady of Sealand, a micronation located about 12 kilometres from the Suffolk coast. Due to its distance from the English coastline, Sealand is classed as being outside British waters and has existed since 1943. 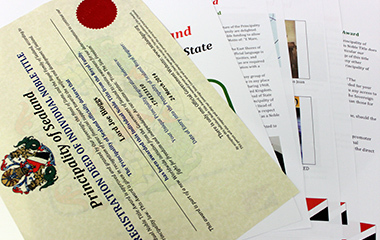 Delivered to you or your recipient by post, your Sealand Lordship pack contains an official folder, containing everything you need to confirm your new Lord or Lady title. 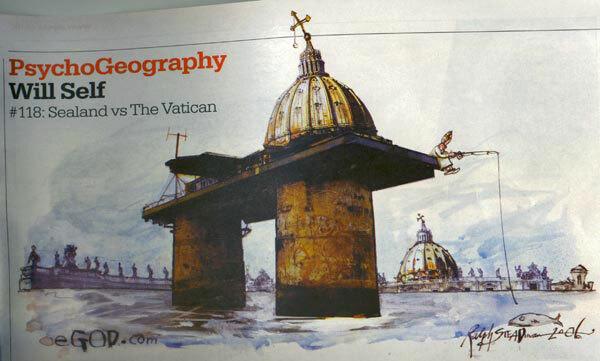 Inside, we provide all the information you need to know about The Principality of Sealand, along with the eventful history of our location, the photos to show you the key areas of Sealand. 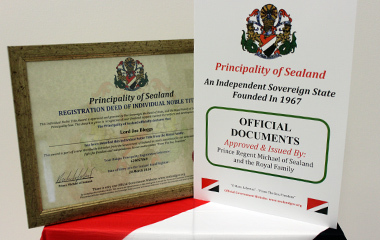 Choose our premium Lordship package and receive your premium Lordship deed both framed and signed by Prince Michael of Sealand. You could also take the option to purchase a piece of Sealand territory with your Lordship title, which will help fund the preservation of this unique principality for years to come, while creating awareness of our location, and increasing recognition of our freedom and independence. Becoming A Lord Or Lady Couldn't Be Simpler! Whether you’re buying a Lordship for yourself, or as a one-of-a-kind gift for a friend or loved one, this life-changing gift really is something which is sure to raise a smile. A perfect choice for birthdays or special occasions, this affordable title is a great gift for the person who seems to have everything or is difficult to buy for. It’s sure to delight whoever receives it – in fact, many customers have told us just how well received it is. Why have a title available to everyone when you could be a Lord or Lady, with all the prestige which comes with it? Buy a Lord of Sealand or a Lady of Sealand title, and bring those dreams of nobility to life. How Long Does Delivery Take For A Lord Or Lady Title? Your Lord or Lady title will be delivered between 5 and 10 days. This window includes all Worldwide deliveries (including USA and Australia). How Long Will My Lord Or Lady Title Last For? Once you purchase your Lord title or Lady title your royal status will last your entire lifetime, there is no expiration date or need to renew. What Is Included In The Standard Lady Or Lord Title Pack? Your Standard Lord or Lady title pack will include your personal title ownership, information and the history of Sealand, photos, location information and an official documents folder. What Does The Premium Lord Or Lady Title Pack Include? The Premium Lord/Lady title pack includes all the elements of the Standard pack but upgrades your personal title to be framed and personally signed by Prince Michael of Sealand. My Lord Or Lady Title Won't Arrive In Time. What Can I Do? We are able to immediately send all of our customers a PDF version of their Lord or Lady title. This is also handy if you wish to post your title online. Is A Record Kept For All Lord And Lady Title Purchases? Only the Sealand Royal family have access to any Lord or Lady titles recorded in the Royal Register.